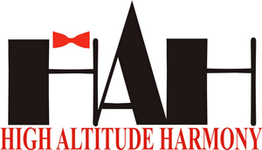 High Altitude Harmony (HAH) members come from all walks of life and we feel that this is one of our greatest strengths. HAH is always looking for new members and voices. If you love to sing (even if it's only in the shower), we'd love to hear from you (pun intended). See details for our rehearsal venue and times.